Alright, I tried it this time and it did create a ROM file for the games, however they're both 98 kb and don't work in emulators. The games are prototypes, one is of the game Moon Ranger and the other is an unreleased title. Any additional information I could supply to look further into this? I will test to dump Moon Ranger and get back to you later. Hm. Well, that's ... a thing. If that works, to get a more-nearly-complete description of what's going on, would you be willing to test a few other things? Do you still get a full-sized PRG dump if you use 0xFFA0 without the +i? If so, repeat with 0xE000, 0xC100, 0xC000, 0xA100, 0xA000, and 0x8100 ? We already know that 0x8400 didn't work, so there's no need to test 0x8000. We know there's a of four registers at 0x4100-0x4103, but what they're doing is unclear. I'm not certain what to check for there, though. Maybe I could try dump this game also. Oh, that's very convenient. The bare PCB means I can verify the full connectivity visually. Anyway, that shows that F-15 City War doesn't have any PRG banking. Anyway, looking at the PRG one last time, try cpu_write(d, 0x4102, (i<<4));. I just dumped my moon ranger and it works perfectly in the emulator. 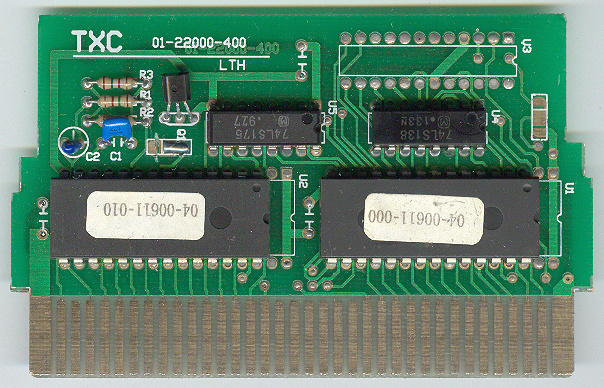 For idle curiosity, would you also be willing to see if the various NC pins on the 05-00002-010 are floating or driven high/low when the game is powered? Doesn't need to be in a NES/FC, just +5V and ground applied. I have this idle hunch that pins 10 and 9 "should" be CPU D6 and CPU D7, and that pins 1 and 24 "should" be PRG A17 and A18. Completely unimportant, though. 8, 9, and 10 are floating, 1 and 24 are at 5V. and although the CHR bankswitching is elsewhere, this is the only place where PRG goes. I guess we could try parroting it completely? If that works, then you could try removing random lines until it stops working? Last edited by lidnariq on Fri Apr 01, 2016 2:19 pm, edited 1 time in total. Edit: It plays but not perfectly, the game seems of. The player and enemy placement is not matching the background tiles. You used the script unedited or made a change? Sorry, I'm a real novice with all the code/terms. Huh. Could be a misunderstanding of how the registers at $4100-$4103 are supposed to work. Which emulator are you testing with? IIRC things that are not FCEUX are more incorrect for this specific mapper. Also, maybe check what lines you can remove from the sequence I gave you to see what's necessary? Last edited by lidnariq on Fri Apr 01, 2016 2:32 pm, edited 1 time in total.